E*TRADE has launched a new commercial, highlighting that hard work pays off for your boss and encouraging people to start investing with E*TRADE. 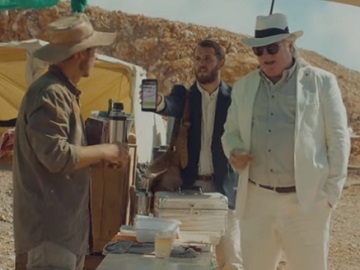 The 30-second spot features a man on a digging site carefully placing a treasure into a suitcase, which is later on taken by his boss, an older man dressed in a white suit. The latter shows up accompanied by another guy and, happy to see the item, congratulates the worker. “Great work, old chap,” he tells him, specifying that it will be him the one to enjoy the richness, while the worker will be famous. He then asks him if he ever considered investing. “E*TRADE has easy to use tools that help you get started,” he says, adding “You like playing with tools, don’t you?”. The commercial ends with the worker watching his boss heading to an helicopter to leave the site, with the treasure. Onscreen lines read “Hard work pays off. For your boss.” and the voiceover says the company’s tagline, “Don’t get mad. Start investing with E*TRADE”.